For our (F)riends, (A)lumni, & (M)ission supporters! Stay connected with the Catholic Gators at St. A&apos;s, find alumni in your area, and find out about reunions, retreats, conferences, and pilgrimages open to all of our CG FAM! Click HERE to update or submit your new contact information! 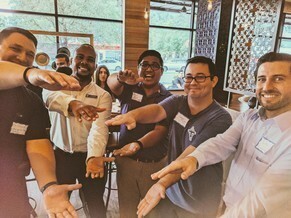 To connect Catholic Gators alumni, to support the Catholic Student Center ministries, and to empower the next generation of leaders in the Church who fully live out their faith and invite others into a closer relationship with Christ. Are you a Catholic Gators alum committed to advancing the mission of the Catholic Student Center: to bring Christ to the campus community and the campus community to Christ? You can do this through a wide variety of ways, including prayer, fellowship, service and learning. The record level of participation over the past four years in our campus ministry programs demonstrates the effectiveness of this outreach, and it greatly due to your contributions at the Catholic Student Center during your time as a student.